I know a woman in her late 50’s. She used to do a lot of canning when she was younger as that was what you did when you lived on a farm and had a huge garden and long, cold winters. When she got off the farm her interest in canning waned. Then one day she got that desire to make jam and jellies and pickles but had nowhere to store them so she made small batches of these items and took them to the local farmer’s market. Her original plan was to just test market to see if any of her products were worth spending time and money working on. The first day there she sold a few jars making enough to work on a larger batch of a specialty item she called a jam but was more of a marmalade mixture of ginger, citrus and rhubarb. The next Saturday she sold twenty jars and made a small profit. It made her think that she could turn her kitchen into a mini preserve factory and whatever was in season she could can and sell. That’s just one example of where you can turn a tidy profit from creating a value-added product. Another example is different flavored products. Vinegar is a kitchen staple that can be twisted into so many different specialty items and flipped into a profit making venture. In fact, all that can hold you up from entering the world of homemade food products for profit is your imagination. 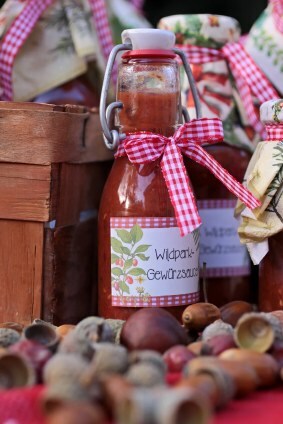 My friend is a fairly creative sort who not only creates interesting chutneys, salsas, jams and jellies in her kitchen, but she gives them creative names like ‘Bananarama Honey’ or ‘Blasted Cherries’ and dresses up the lids of the canning jars to make them look interesting. In addition, while at a farmer’s market she even provides samples of her products which have on more than one occasion pushed someone from a casual looky-loo to a regular customer. But what if you aren’t so handy in the kitchen or just can’t figure out a way to preserve food from your garden? There are many other ways to turn a regular item into a value-added product. Keep in mind, the term value-added means just that. When you take something like an herb that you could sell as is from your garden for a small profit and turn it into a specialty item like a hand cream or lotion which will earn much more revenue and profit from turning it into something else. Farmer’s markets and specialty niche and boutique stores are great places to find ideas as well as possible places to sell your value-added products. Here are some ideas to get you thinking. Jams and jellies made with fruit and vegetable combinations including fragrant flowers. For example, lavender jelly. Speaking of herbs, there are so many ways to turn herbs into value-added products ranging from bags of dried leaves for teas to producing essential oils for aromatherapy purposes. If you do some homework online you’ll discover there is a huge market for herbal teas and essential oils for use in alternative medicine. The oils in particular as a result of the healing properties of many. Other herbal value-added ideas include growing catnip and creating cat toys with your home grown herb sewn inside or dream pillows which are herb-filled mini-pillows that assist some people in dealing with issues related to stress, anxiety or difficulty sleeping. All of these ideas guarantee resale opportunities as each of the value-added products I’ve described will either be used up or require replacement in order to continue to be useful for the purpose they were originally purchased for. Garlic is another value-added crop that offers many different possibilities from braids and wreaths to the scapes (the young greens) which are used in stir fry’s, salads as well as can be pickled. Speaking of pickles, you can pickle a huge variety of items from your garden which turned those items into value-added products.